Spent my sweet Sunday morning with my gang of girls - Zoo Is Cute. Been a long time didn't meet up and they did colored my day. We had our gathering venue at House of Dim Sum, most of us were late except the organizer. Sorry for the wait. Although not all the ZIC members show their face up, all busy with their final year project, it's fun tho. Zwai says I look like Patty Hou (侯佩岑), did I? She and her uni friends all think that I kind of look like her, they are first to say so. Before we left, we had our photo session again with weird poses, thanks to our photographer: CheeYan's love one. Kinda weird to snap photos at that place, people eating and aunties look at us like we are weirdos. 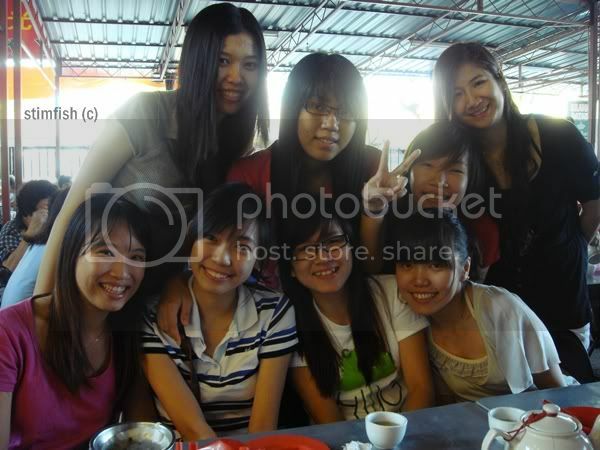 Fantabulous photos we had, hope that we have another gathering during the CNY. "Then I must be Jay Chou"
Met up with Chung Hwa guys at night, thought it was just a few of them, but when we reached, they were having their gahtering. Luckily I knew quite a number of them, still felt awkward as I'm not from the same secondary school. Yet, nice meeting them, met up with Jeremy Choo as well, we just met up once a year; hardly meet up with him.